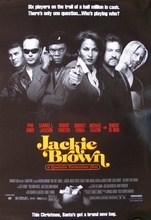 Jackie Brown, flight attendant and small-time cash courier for drug runner Ordell Robbie is arrested and faces a long stint in jail; she agrees to help the FBI catch Ordell but also has some plans of her own. Tarantino's third film, not in the same league as his first two but quite solid on its own merits. Robert Forster received an Oscar nomination for Best Supporting Actor.